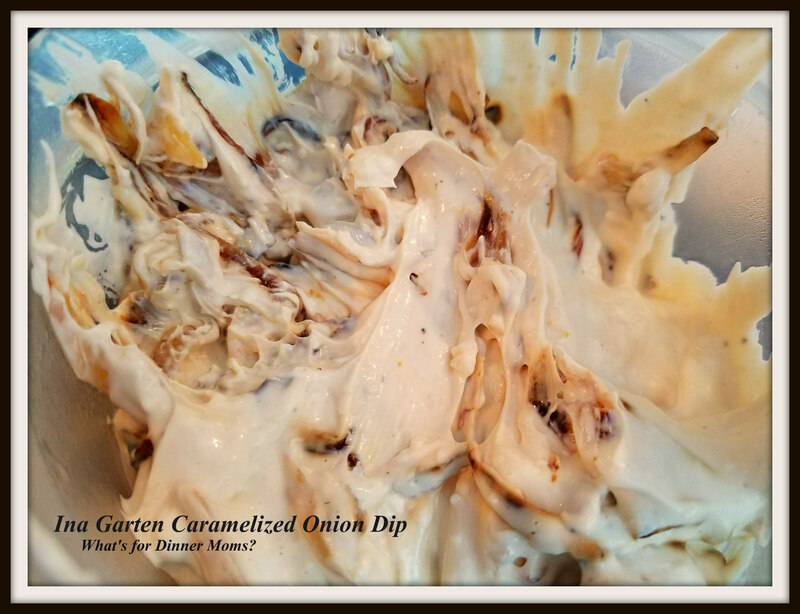 Ina Garten’s Caramelized Onion Dip (remade by me) – What's for Dinner Moms? This picture is not a good at all but I was trying to snap a picture of this dip before it was devoured by my family. They were reaching around me trying to get me to put it down on the table because they all wanted a bite. This recipe was all over Pinterest, Facebook, and Instagram just before the Super Bowl. You know I had to try it because well, caramelized onions. I LOVE caramelized onions. They are easy to make and if I can make the dip rather than buy it I am even happier. I love Ina Garten, The Barefoot Contessa. I dream of throwing her dinner parties where she takes some homemade ketchup, capers and flour and make a three course meal. I swear she is magical. I have said I love Ina Garten but when I made the dip according to her recipe it was well, meh. It was good but I thought it needed more flavor. So, I reworked the recipe just a bit by taking out the oil and adding a bit of Worcestershire sauce to add a depth of flavor that I felt was missing. Once we made those tiny changes we loved it! Tip: I would recommend not only slicing the onions thinly but cutting them in half before cooking them otherwise you get these weird long onion strands that hang off the chips and dip as you are eating. Melt butter in a large skillet over medium-low heat. Add onions to pan and let cook for about 5 minutes. Stir and lower heat to medium low for 15-20 minutes until onions are golden in color. Add Cayenne pepper, black pepper and a pinch of salt. Stir occasionally. While onions are cooking beat cream cheese, sour cream and mayonnaise until smooth with a mixer. Once onion have cooked and have cooled add them to the sour cream mixture. Beat well to mix. Add Worcestershire sauce and stir well. Taste and adjust spices as necessary. Previous Post Making Simple Dinners Look Amazing! Can’t wait to try your version! I also found it a bit bland when I made it as written. It was the Worcestershire sauce that made all the difference to me. It added the salty taste I was looking for. Hope you like it! Lol..to fast photo before devoured..sounds amazing. Thank you! It was tough. Oooh, good call on the Worchestershire! That’s my go-to for all kinds of dishes to kick things up a notch. 😀 This looks delicious! Thanks for sharing! Thank you! Worcestershire Sauce makes everything better!